For some readers, it may be news that there were tornadoes in the Midwest the first weekend in December. While it did not make headlines the way hurricanes or wildfires have recently, the storm system that went through Illinois, Missouri, Arkansas, and Oklahoma last weekend packed a wallop, with 23 tornadoes reported touching down in Illinois alone, according to the Washington Post. One of the hardest-hit communities was Taylorville, a Central Illinois town of more than 11,000 that was struck by an EF-3 tornado with winds between 136 and 165 miles-per-hour that was half-a-mile wide at its largest point, according to the Peoria Journal-Star. It left 51 homes destroyed, another 50 severely damaged and more than 500 buildings affected, according to Smith and fellow PDA team member Kathy Montgomery. Thankfully, there were no fatalities in Taylorville. There were 30 injuries, with one person still hospitalized as of Friday, Smith and Montgomery said. 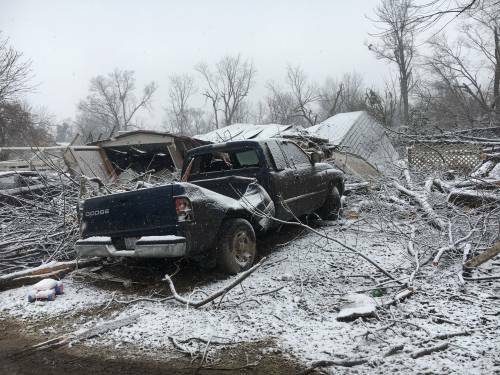 On December 3, the Presbytery of Southeastern Illinois requested and was granted an initial assistance grant of $7,500 to address the impact of three tornadoes in Taylorville and surrounding areas. The grant request estimates a recovery period of 18 to 24 months. Montgomery said she was aware of seven single-parent families seeking assistance in the aftermath of the storm. Unimpacted by the tornado was First Presbyterian Church of Taylorville, under the leadership of Rev. Michael Evanchak. The church has been active since the tornado in feeding people and assisting with recovery, including church members who lost homes or suffered serious damage. Smith and Montgomery noted an active member of the church had lost his home to a tornado for the second time in 10 years. “What’s making a difference in this community … is the community is working together,” Smith said. “They are off to a very fast start in terms of putting together a group that can be the nucleus of a long-term recovery committee. And what I am very proud to see is that the ministerial association, which has been together for years — of whom the Presbyterian pastor (Evanchak) is the chair — they are taking essential lead in terms of the reconstruction of the community. If you wish to give to the Presbyterian Disaster Assistance for Taylorville, please mark “PDA” in the memo portion of your check made out to MZPC. 2019 Offering Envelopes are available in the transept room. Please take your envelopes home to save the Church the expense of mailing them. We had a great last night of LOGOS before breaking for Christmas break. It was our "Angels Among Us" night, and we took cookies to both the Mt. Zion fire department and police station. 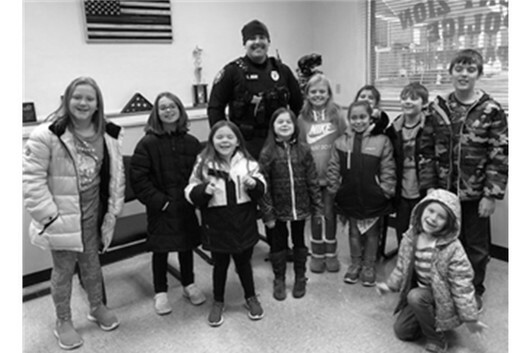 The younger kids delivered to the police station, and there was one officer that was in the building, who just so happened to be Lucas Bray who used to come to LOGOS! That was a definite God moment! Also, in lieu of Christmas gifts to the LOGOS kids, the table parents made donations that will allow us to purchase a piglet and a flock of chickens from the Presbyterian Giving Catalog in honor of the children and youth of LOGOS! YOU’VE GOT CHRISTMAS CARD MAIL! If you have friends at church you wish to send Christmas cards, bring the cards to church, organize them alphabetically, and put them in the Christmas card box on the table at the east entrance to the Sanctuary. Please check the box from time to time throughout the Christmas season to collect your Christmas cards. Thank you! Note: Consider donating any money you save on stamps to your regular giving or to a favorite charity. Our Moms’ Group is having dinner at Las Margaritas in Mt. Zion on Monday, December 17 at 6:00 pm to celebrate Christmas together. This is an adult-only evening. RSVP to Molly by 12/16. Our Condolences to: Alice and Cecil Barr and family upon the loss of their son-in-law, Ralph Hodge; to Kim and Rodney Goss and family upon the loss of his father, Donald Aubert; and to Valerie Cowgill and family upon the loss of David Cowgill. Please pray for: George Bray, Nina Kays, First Presbyterian Church Taylorville, Dave Rozanski, Janet Collins, Sally Dennis, Verna Trimby, Pat Willis, Loni Green (Rachel Gould’s friend), Bob Bjerke (Pat Willis’ brother-in-law), Beverly Gant, Crystal Brothers, Gladys Workman, Steve Hubner, Joyce and Randy Williams. Sun., Dec. 16 3rd Sunday of Advent/Annex rented. Saturday, December 22 Annex rented. The next Herald will be published December 19.